You must make reservations at least 5 minutes in advance of the time at Double Knot. Limited street parking is available, in addition to public parking lots on Sansom Street in between 12th & 13th Streets and 13th & Broad Streets. There is also a parking garage on the corner of 13th Street, in between Chestnut Street & Market Street. Double Knot is an ideal location for entertaining. Two semi-private dining areas that can accommodate up to 30 and 40 guests respectively are perfect for gatherings of any occasion. The entire restaurant can seat up to 70 for a sit down dinner or in excess of 100 for a social gathering. The sushi counter offers a one of a kind, personalized experience for 12 guests. Our event coordinator will work with you exclusively as you plan your event. 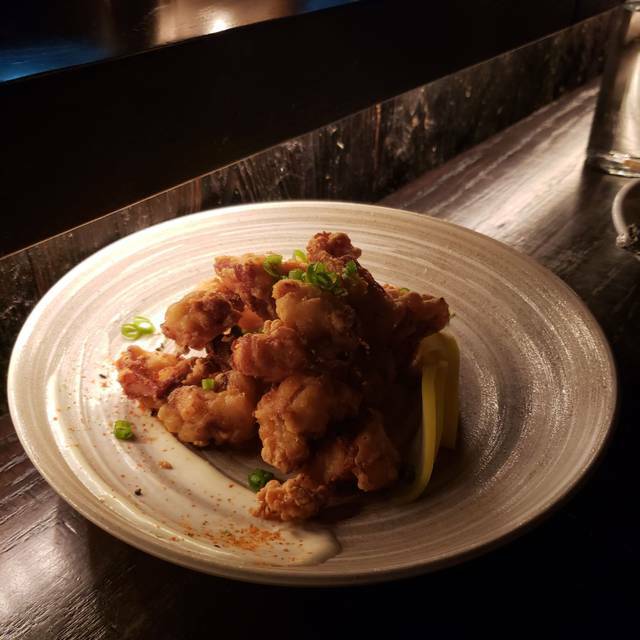 Double Knot, a Japanese Speakeasy, is the newest addition to MJS Restaurants brought to you by critically acclaimed Chef & Restaurateur Michael Schulson . 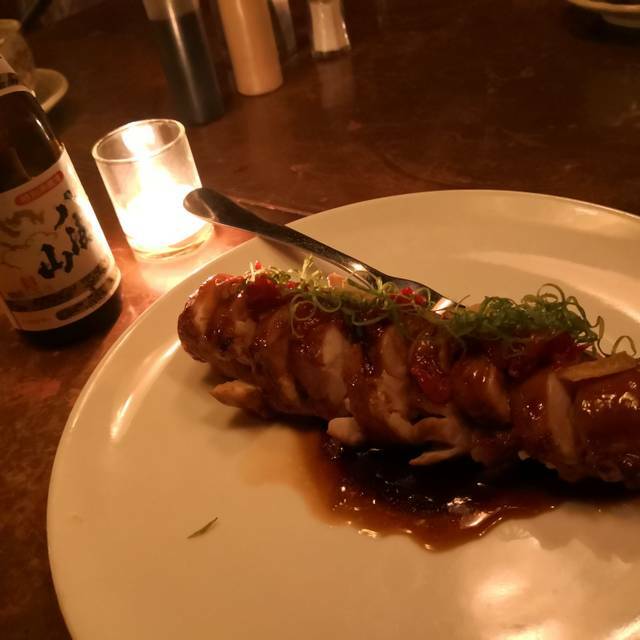 This Sushi and Robatayaki bar tucked away on 13th Street beneath a first floor coffee shop features small plates, fresh ingredients and cool cocktails. This secluded gem is sure to be the city’s best hideaway. Everything was great. Had no complaints. Food was phenomenal, especially the black cod rice, scallops, lamb chop. We loved the food here! We did the 10 course Chef’s choice and it was spectacular. $60 a piece for that dinner but worth it! Service was exceptional as well. 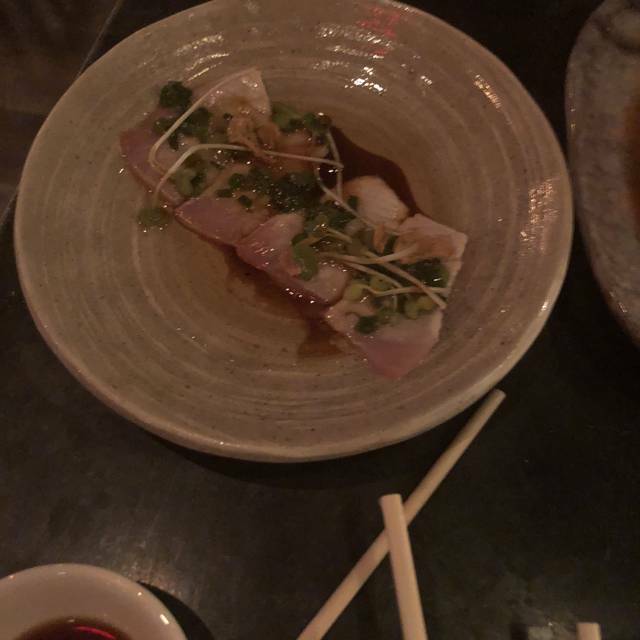 While the ambiance and attentive server (Nathan M) are outstanding, the food doesn't live to expectations. We ordered the blind chef tasting menu. From the start, items were coming out very fast. It's tapas style and I totally get that. We ate a full tasting menu in an hour, which felt like they were trying to flip the table. Many of the dishes lacked basic seasoning and our steak was cooked well done (I'm a medium rare person and I wish my server asked my preference). Also, to add flavor to the dish, I needed to add sauces from the table. I felt compelled to add mustard to my steak to give it flavor. Overall, the meal wasn't worth $200 to sit in a pretty space. Nathan M was wonderful and attentive. Food was outsatanding! Even our hard to please 5 year old enjoyed the meal. We had the short ribs and Kobe beef robatayaki which was tender and juicy and the eel hand roll was perfect. He kept saying it was the best dinner ever😁! 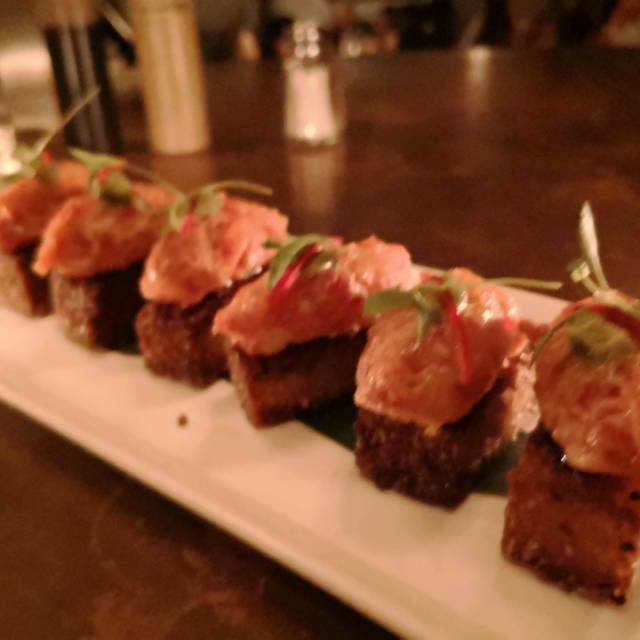 The food and experience at double knot was simply amazing! I’ll be back next month to dine here again! Once your in the restaurant the experience is great. However, the upstairs waiting area/bar was very crowded, drinks took an extraordinary amount of time to make (they ran out of glasses at one point), and overall could have been a better experience. Absolutely phenomenal dinner. Great service. Everyone should experience a meal here. Food and service was great and really liked the ambience but the tables are too close to each other and the noise level was on bearable for a nice evening out. Had a wonderful time. Food “to die for”. Ordered multiple dishes. Recommend the Kobe beef, endamame dumplings, chicken thigh and the seafood plate. Speedy service. Extremely pleasant waitress. 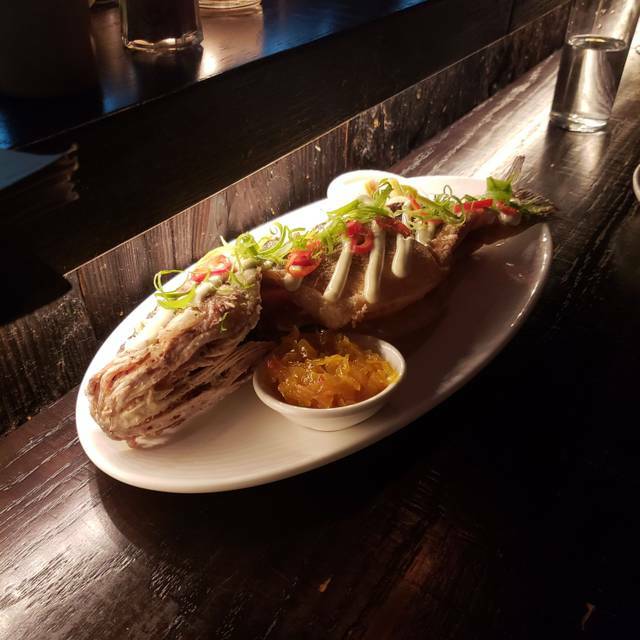 Fantastic food, excellent service! So much fun to be able to have a taste of such a variety of different dishes. Yummy cocktails, too. The food, ambiance and staff were wonderful. Now one of my favorite restaurants in Philly. I recommend it. Neat décor with sushi bar down in the basement. Neat, romantic environment downstairs. Really great experience. Superb! Must go to spot! Everything about the ambiance and the food was exceptional. Great service too. Outstanding service and selection. Was visiting Philly for business and so glad I stopped in here. It is well worth it! Highly recommended! Fourth visit. Very disappointing. Food quality has declined Food ranged from fair to bad. Some sashimi looked old and dusty. Tasted no better. Shumai and fried cheese balls greasy and low quality. Octopus downright bad. Despite repeated requests to slow down food was thrown at us. Two courses before our wine and water were served. I’ll never go back. Not sure how this place gets such great reviews. I had several items that were reported to be what the restaurant is known for but was generally disappointed. I found the robata to be generally flavorless. The sushi likewise was flavorless; further the sushi was all pre-cut fish that just needed to be stacked onto rice - far from high end. Cocktails were great. Service was basically neglectful. The couple seated next to me went through 2 rounds of food asking at both times that they get the bottle of wine that they ordered before any more food arrived - the wine came halfway through the second round of food. Would recommend that there are far better restaurants in Philly than this place. The space is very cool. Checks all the cool boxes but totally misses on service and substance. A wonderful experience. 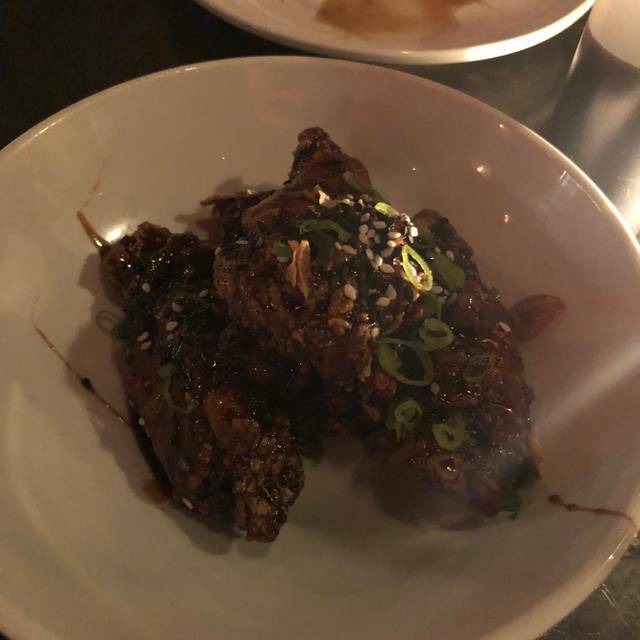 I visited for a conference and based on reviews, chose to go to Double Knot. I had the chef's menu, and it was fantastic. It was a great price, lots of selection, the server and chef made great choices for me based on my allergies. Everything was very tasty. My only comment is that I got ten plates in 35 minutes, and it felt rushed. Took my girlfriend out to Double Knot for the first time. It was a great experience. Ambient lighting, delicious food. Our waiter was very informative and patient. Will definitely be there again for sure. Excellent food. We ordered the testing menu and let the chef decide the dishes. All the dishes were exceptional. Only thing keeping this from being 5 stars was the way over cooked hanger steak that finished the tasting menu. Too bad! Loved everything about the experience! Food was so delicious - the menu is extensive and overwhelming, so we chose pescatarian chefs choice and it didn’t not disappoint. Halfway through we thought we might still be hungry at the end, but the last 2-3 portions were much larger and we were completely stuffed! Make sure you save room for the cod - it melts in your mouth! Great ambiance and service, would definitely go back next time we’re in philly. Fantastic service competes with the imaginative food. This is Japanese for people who don’t think they like sushi, but the sushi is pretty amazing too. Too dark in the restaurant and food comes too quickly. Jordan took great care of us! He knew details about all the dishes and was very kind and helpful. The food was exceptional. I especially loved the sea bass and the steak skewers. The gyoza was very surprising in it's presentation and incredibly delicious. I also very much liked the tacos. I think the brussel sprouts were far too powerful. Overly garlicky and too much vinegar. The flank steak was unremarkable. I very much enjoyed the ambience at the restaurant. Cozy, modern, and romantically lit. We we're at the bar, but we're still very comfortable and well taken care of. The service ended the second we paid the bill = no one checking if we needed water etc. other than that it was fantastic! The food was out of this world! I took my girlfriend out for a date, and want to thank Double Knot for a fantastic night. Our server patiently explained everything about the dishes, accomodated our dietary restrictions, and constantly checked in to see how we were doing. Overall, great food and great service! Had tasting menu on a Tuesday evening. Good bargain. Had wine and enjoyed everything. Served dessert, paid bill & left. Next day we realized we never received last course. Sea bass. I called to speak with manager. I just wanted an apology or an explanation. Well, no one ever called me back. I did not want something for nothing. Just a return call. One of the best places I’ve been too, this is tops. Seating is by the bar area and downstairs, at first I was like what the heck I don’t usually like basement seating, BUT this in my opinion was like a speakeasy setting and I absolutely loved loved it. Very cool!!!! Great food, service and very cool setting. Double Knot absolutely lived up to the hype! We booked day of, which meant being seated at the counter service downstairs. But we didn't feel like that detracted from the experience at all, we'd be happy to sit there again. The service was outstanding as was each of the dishes we ordered to split for the 2 of us: salmon and mackarel sashimi, japanese fried chicken, wild mushroom gyoza, salmon scallion robatayaki, pork belly robatayaki, spicy tuna roll, special roll (spider roll), black cod fried rice and for dessert we got the chocolate genmai cha. 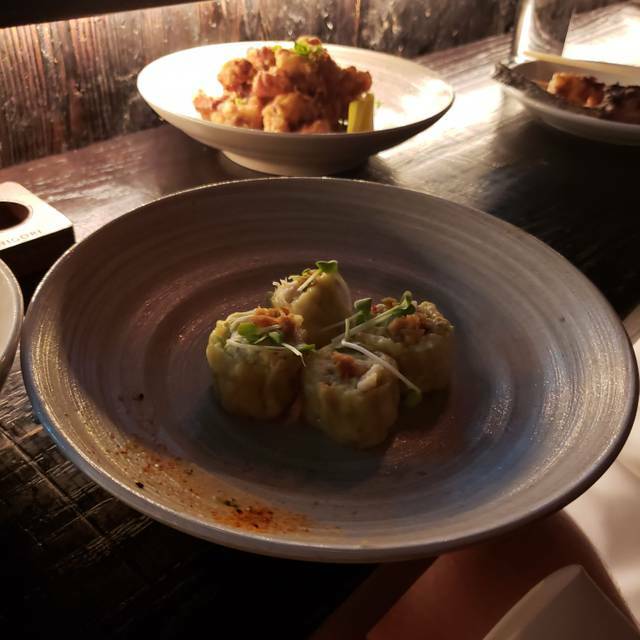 Like Sampan, most of the dishes are tapas style, so you can order a la carte or do the chef's tasting menu for $60/pp. We each ordered drinks, which were amazing. 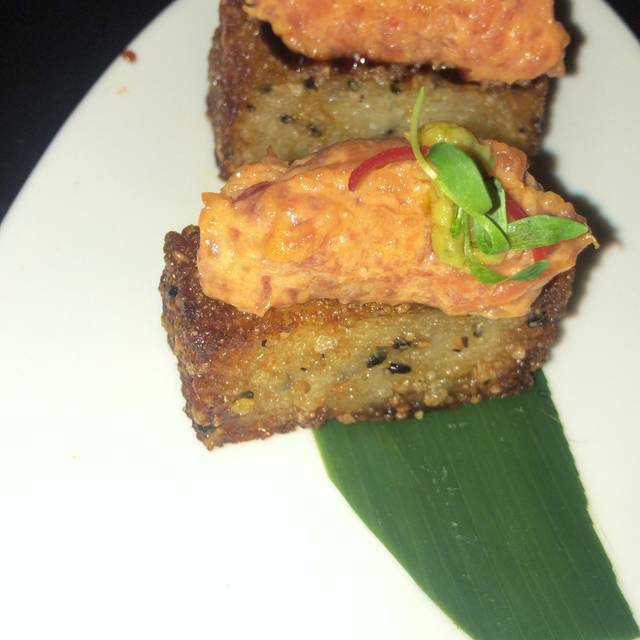 We will absolutely be coming back (and next time ordering more sushi -- the spicy tuna roll was the best we have ever had!). 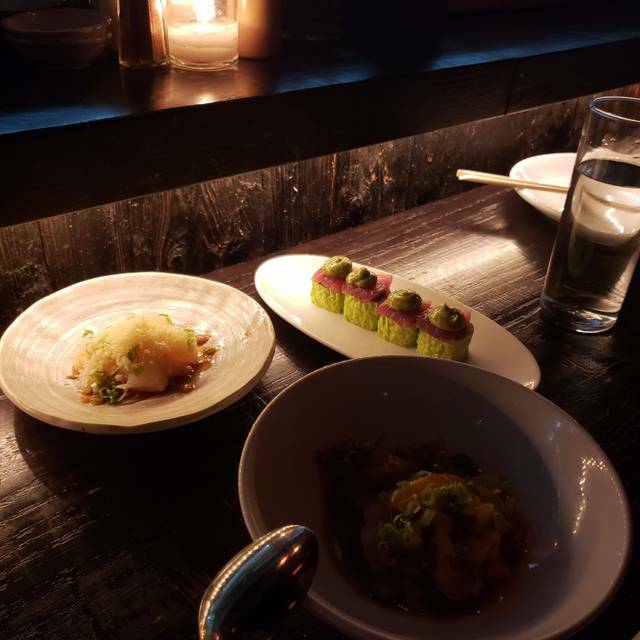 Good atmosphere, great drinks, but food portions are so small and pricey.Would go again for cocktails and mochi ice cream. Friday night was very busy, waitress not attentive. 30 mins for a drink. Sushi was amazing quality. Atmosphere was nice. Friends birthday celebration. Wonderful food and drink. Service at times slow. One of my favorite places to eat in Philadelphia. The waitstaff was knowledgeable and helpful in food selection. This is a great place to eat at a moderate price range. There is a very nice ambiance, the wait-staff is friendly and helpful, and the food is amazingly good. Every dish we have tried there was outstanding. Awesome service. The manager actually asked us about our dining experience afterwards. Very cool speakeasy ambience. Awesome food and potent and tasty cocktails.